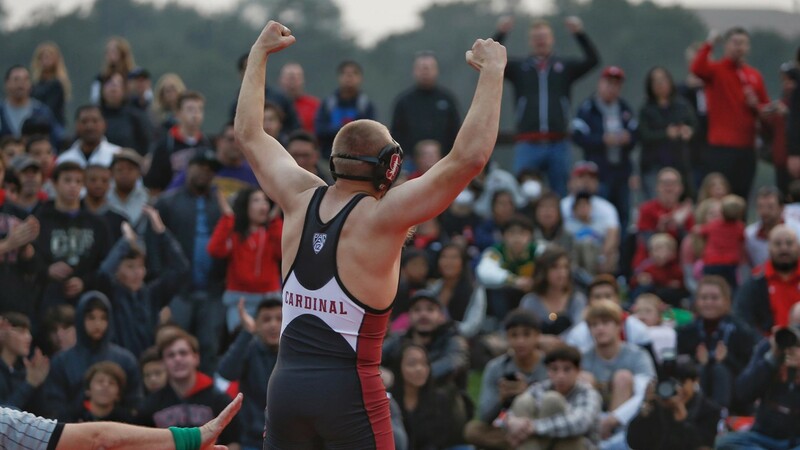 CBS Sports Network, in conjunction with DragonFli Media Technologies and Left Coast Wrestling, will televise the collegiate wrestling showcase, “Battle on the Midway,” to a national-television audience in prime-time this Sunday, Nov. 25 at 8 p.m. PT (11 p.m. ET) and on re-air Friday, Nov. 30 at 8 p.m. PT (11 p.m. ET). The Battle on the Midway features a collegiate wrestling dual between Stanford University and Fresno State University on the deck of the famed aircraft carrier USS Midway. Steve Quis will handle the play-by-play, former NCAA Champion and All-America Adam Tirapelle will provide analysis, while Brooke Landau will serve as the mat-side reporter. “This is a tremendous opportunity to showcase college wrestling and I can’t think of a more iconic setting than to do so than aboard one of our nation’s most-storied aircraft carriers,” said Aaron Root, President and Chief Operating Officer of Left Coast Wrestling. Wrestling out of the Pac-12 Conference, Stanford is 1-0 to start the 2018 season. Cardinal Coach Jason Borrelli has a young squad that features 13 freshmen, nine sophomores, five juniors, five seniors and one graduate student. A member of the Big 12 Conference, Fresno State is off to a 3-2 start to open the 2018 season. Bulldogs Head Coach Troy Steiner’s squad features 15 freshmen, four sophomores and seven juniors. Fresno State and Stanford met in a dual meet in 2017 in Fresno, a match won the Cardinal by a 27-15 count. This will mark the second-straight year that the USS Midway has hosted a collegiate wrestling event. The inaugural Battle on the Midway was staged Nov. 21, 2017 and featured Fresno State and the United States Air Force Academy. Decommissioned in 1992, the USS Midway is the United States’ longest-serving aircraft carrier, having served more than 200,000 sailors from 1945-92. Originally commissioned a week after the end of WWII, the Midway saw action during the Vietnam War and it served as the Persian Gulf flagship in Operation Desert Storm. The most-popular maritime museum in the United States, the USS Midway has previously hosted sporting events, including a college basketball game between Syracuse and San Diego State. The inaugural Battle on the Midway was the first collegiate wrestling event staged atop the iconic carrier.